Equifax is Ohio State’s selected vendor to provide 1095-C forms. In order to receive an electronic copy of your 1095-C instead of a paper copy, employees can consent through the Equifax website, Tax Form Management. You can access the website securely through Employee Self Service. 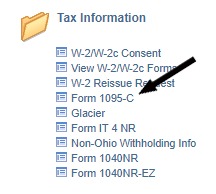 Select “Form 1095-C” in the Tax Information folder under the Time and Pay section. Your 1095-C for the previous tax year is available by February 18, 2019. If you provide consent, Equifax will email you when your form is available. Contact a tax advisor for questions about how the tax form may impact you or visit irs.gov or healthcare.gov. Considered full-time employees and eligible for The Ohio State University Faculty and Staff Health Plans at any point during the tax year (even if those employees declined to participate in the medical coverage). 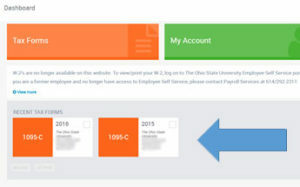 As a current employee, you should log into Employee Self Service using your Ohio State username, password and BuckeyePass authentication. Select “Form 1095-C” in the Tax Information folder under the Time and Pay section. Once you are logged in, you will see the Equifax homepage. From the Equifax homepage click “My Account” in the menu list on the left side of screen. 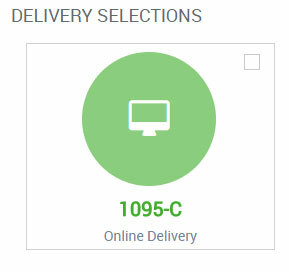 On the My Account page, under the “Settings” tab, you will see one of the icons below to indicate your current 1095-C delivery status. To change your delivery status, mark the checkbox within the 1095-C button and follow the prompts. You have previously consented to online delivery. You have not consented to online delivery. To provide electronic consent, mark the checkbox within the 1095-C button and select “Give Online Consent.” A new screen will appear to provide important disclosures specific to giving or removing consent. On the following screen, review your contract information, then select “Confirm & Submit.” If you notice an error in your contact information, hit the pencil icon and update the information. You will also want to make sure you update your contact information in Employee Self Service. 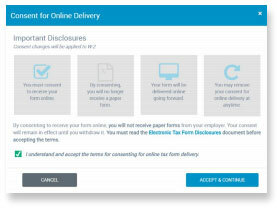 After you confirm your information, you will see a receipt page indicating that you have consented to online delivery of your tax form. Your most recent tax forms will be available on the Equifax homepage. Mark the checkbox for the tax form you wish to print. You can then choose to save your form or print it. Go to mytaxform.com and enter Ohio State’s Company Code, 10380. Enter your OSU Employee ID (if you do not remember your OSU Employee ID call Office of Human Resources Customer Service at 614-292-1050). Enter your PIN, which will be something that you previously established when accessing your 1095-C (or W-2) tax information. You may be prompted to reset your PIN. If you are a new user, you may be asked to provide basic personal information, including address, phone and email options. If you are a returning user, you may be asked to review existing profile information, including contact methods, and indicate your primary address, email, and phone preferences. NOTE: It is possible that some returning users may be treated like first-time users if they choose “Forgot User ID or PIN” or if our protocols identify a need for additional screening. Next, you may be challenged to verify your identity via the One-Time Passcode (OTP) process. Screen prompts will walk you through the process to deliver an OTP that will be sent via phone, text (SMS), or email. 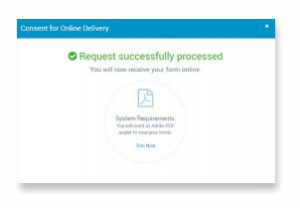 You may select the delivery method, and you must remain in the application (do not log out, do not close browser) while waiting for an OTP to be sent. Passcodes are sent in “real time,” and you should enter the received passcode immediately into the application you are trying to access. 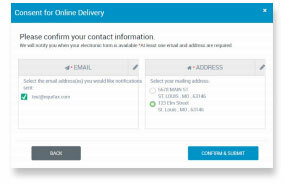 If you cannot receive an OTP via a real-time method, an OTP may be sent via U.S. Mail. Please keep in mind that it may take several days for you to receive the passcode. You will have 12 days from the generation date to receive and input the code. Once your identity is verified, you may be prompted to reset your PIN. You may also be asked if you’d like us to remember the device you are on to make future logins easier. Select “Yes” if you are logging on from a device you use frequently. Select “No” if you are logging on from a public device, or one you do not plan on using in the future. Once you have successfully logged into your account, you will be directed to the Main Menu. If your identity cannot be verified, you will be directed back to your employer for further assistance. If you have problems logging in, please contact HR Customer Service at (614) 292-1050. If you miss the consent deadline for the preceding tax year, your form will be mailed to the home address on file in the HR system. You can still provide consent to access your form online, and you will receive both mailed and electronic form. If you would like to provide electronic consent you may do so at any time. The Form 1095-C is required under the Affordable Care Act (ACA). It contains information about medical coverage offered to you and your dependents by Ohio State. The IRS uses this information, in part, to validate your compliance with the ACA’s individual shared responsibility requirements. Considered full-time employees and eligible for The Ohio State University Faculty and Staff Health Plans at any point during the preceding tax year (even if those employees declined to participate in the medical coverage). Confirm your home address in the HR system is accurate so that the form can be mailed if you do not wish to receive it electronically. Go to Employee Self Service and click on Personal Information Summary. Select Change Home/Mailing Addresses. If you wish to make a change, click “edit” on the home address line. Medical Center employees should use OneSource. Ohio State is required to send the form to individuals who meet the eligibility criteria as part of its reporting obligations under the ACA. You can use information from the 1095-C when completing your federal tax return. Please consult with your tax advisor if you have questions about how the 1095-C information applies to filing your tax return. The IRS also offers additional information here.